Steve forward the exhibit you put together. Nancy, I must congratulate you on the wonderful work you did to highlight the hard work that Steve has done these many years. Steve & I have developed a wonderful friendship since I was the curator at the Virginia Holocaust Museum. His tribute to the Gross Breesen & Hyde Farmland members is a story that needs to be seen by all people. It tells a story of love of these young youth who became family to each other. How they were saved by caring citizens of the world at a time when hell was in charge. I was blessed to have met the living students of Gross Breesen and Hyde Farmland during their annual family meetings several times. My Uncle Ray Miller, who lived in Pensacola, N.C., was curious about everything. In my family, he was our only entrepreneur. He loved the West, and he was clever, both in his mind and with his hands. He turned a trade as a TV repairman in California into a lifelong business, bringing cable TV to homes all across the southern United States. During his lifetime, he not only owned cable franchises but telephone companies; he was a deputy sheriff and a pilot, he built airports, and he foresaw how the internet and television would unite as early as the 1990s. To my family, on a dairy farm in upstate N.Y., Uncle Ray and his family represented adventure. When I was about 11, in 1964, he brought his whole family, my Aunt Mary Anne and my cousins Debbie, Keith, and Randy, to visit us in his big Streamline Travel Home, what we called “the bus.” It was the size of a Greyhound bus and it contained a kitchen and even a shower for a traveling family of five. You can imagine what a sensation that big shiny bus was in tiny Remsen, N.Y., population 564. People were talking about it for days. That bus wasn’t the only vehicle of Ray’s I remember. When I was 16, my family visited the Millers in North Carolina, and Uncle Ray, who by then had his pilot’s license and had built his own airstrip, flew my father and me – probably the only ones in the family brave enough to go -- to Macon, Ga., in his small private plane. Those stories are just to prove something my mother always said about her brother-in-law Ray Miller – he could do anything he set his mind to. One of those things was to help my father and Steve Strauss with a project that they thought important. Ray had talked to my father about his experience in Nazi Germany. My father, born in 1918, was a Holocaust survivor, although he never would have used those words – he called himself a German Jewish refugee. He had been fortunate enough to be sent at age 18 to a rural estate called Gross Breesen, in German Silesia, on the border with Poland, whose objective was to train Jewish youth in farming skills. Those skills would help them get visas to agricultural countries like Brazil and the Dominican Republic (the U.S. had a quota on refugees from Germany, despite the terrors afflicting Jews there). My father was one of the few kids to come from the countryside; his father owned a team of horses, so he was already an expert compared with Gross Breesen’s city kids. 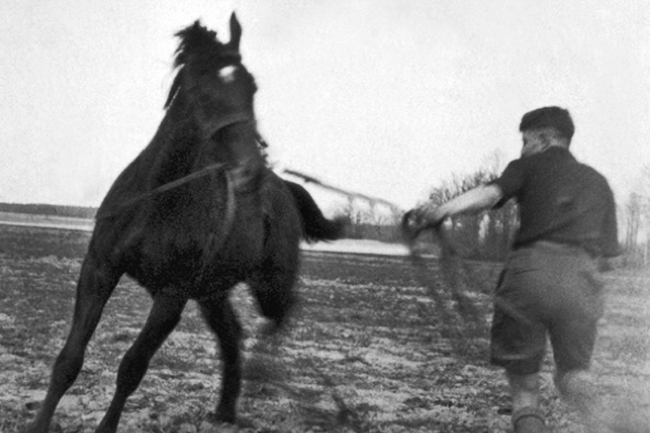 In the exhibit here at the University of North Carolina-Asheville, there’s a wonderful picture of my father breaking a horse. Among the 130 or so Jewish kids sent to Gross Breesen, which occupied a former nobleman’s castle on more than 500 acres of farmland, were several skilled photographers. They recorded their life there, raising sheep, dairy cows, even pigs – I guess they weren’t very religious – farming vegetables, washing clothes, and cooking food for everyone. In the evenings, they studied German and western culture, performing chamber concerts and Shakespeare’s plays. Lots of the residents, including my father, had photo albums with which to remember their time there, which was idyllic and educational. Until Kristallnacht, when the Nazis came and smashed the piano, and arrested all the men over age 18. My father had already left Breesen at that point but was arrested on the street in Frankfurt. He was sent to Buchenwald, a lucky coincidence because the Breeseners were sent there too. Lucky because the Breeseners had been allowed to bring blankets; my father, arrested on the street, had nothing; it was November 1938, and it was cold. My father always referred to this as the first Gross Breesen reunion. (They had many more, starting in 1984, when my father hosted the second one, in Barneveld, N.Y.) They shared the blankets; fortunately for my father the Breeseners had a network of people outside the camp working to get them visas so the Nazis would release them. Buchenwald released my father in January 1939. He went to Holland and, a year later, to Virginia. How they got around the quota is another story. Uncle Ray knew these stories; he had talked a lot with Dad about his life; he was also a voracious reader who found history fascinating, especially the Second World War. Steve Strauss, a New York photographer who met my father through a mutual friend, learned these stories too. Steve had a vision for how the images in my father’s photo album could be used to showcase the Gross Breesen story, which is one of immigrants, of escape from political persecution, and of what ultimately became a life-saving education. The black and white photographs you’ll see in this exhibit were tiny, some of them no more than a couple of inches square, but they tell the story of my father’s life-affirming experience at Gross Breesen, an intellectual haven that replaced college for a small group of young people surrounded by hatred. Steve saw in my father’s album a museum exhibit for college and other students everywhere. But they couldn’t transform the tiny photos from the album into an exhibit that would mean something to the general public without money, and that’s where Uncle Ray played the most important role. “We couldn’t have done it without him,” Steve told me recently. Sometime in the early 2000s, no one is sure exactly when, Ray told my father that if Steve could show him how he would use the money, he would donate $25,000 toward the making of this exhibit. I’m not sure what happened then. Steve doesn’t recall, and my father died in 2012, and Uncle Ray died last December. I imagine that Steve enlarged a photo so that Uncle Ray could see what the exhibit could look like, Uncle Ray wrote a check, and now we have this wonderful exhibit on view for students and visitors to UNC-Asheville. It has also been at the Virginia Holocaust Museum, in Richmond; at the New Jersey Museum of Agriculture, at Rutgers; and in the George Landecker room of Unity Hall in Barneveld, N.Y. Steve is talking to the Leo Beck Institute in New York City, which may display it next year, on the 80th anniversary of Kristallnacht. He has even communicated with people at Palac Brzezno, the fancy golf resort hotel, now in Poland, that Gross Breesen is today. So please, if you know of other venues that might be interested, let Steve know. That was my father’s lifelong dream – to share the story of his profound experience at Gross Breesen, which helped him escape Nazi Germany to an America where he could build a life. You can learn more about what life was like for these young people, mostly teen-agers, cut off from the world they knew by prejudice and bigotry, and, for a short time at least, caught in a rural sanctuary far away from fear. Watch the video that accompanies these pictures, in which my father and other survivors, then in their 80s, remember Gross Breesen. Read the text, which comes from a series of RundBriefen, or letters they circulated among themselves long after the war. I hope you enjoy the exhibit and learn a lot. It is thanks to my late Uncle Ray Miller, of Pensacola, N.C., that you can do that. On behalf of the Brandeis National Committee of Central Westchester, I would like to thank you for the excellent and well-received program you presented. Those in attendance were impressed with the scope of the program that you undertook to educate the general population as well as people of the Jewish fatih. May you have continued success. I hope that the summary that I wrote will be of use to you and that you can use it in your exhibition. On June 6, 2017, Steve Strauss presented his program on Gross-Breesen to 30 members of the Central Westchester Chapter of the Brandeis National Committee. Gross-Breesen was a 567-acre farm on the German-Polish border which operated as a school for Jewish youth. The plan was to get visas for Jewish youth to emigrate to Brazil, so the "Breeseners" studied growing coffee, and by experience learned other skills they would need to farm anywhere - milking cows, shoeing horses, carpentry and cutting hay. In the evenings, they studied English and Portuguese, read poetry, played in or listened to a string ensemble, or heard lectures by a visiting philosopher, Martin Buber. In addition, they attended lessons in Jewish culture and acquired the spiritual strength to strive and survive. Using DVD slides of old photos of the actual campus, and stories by participants in the program, Mr. Strauss created a multimedia program which was well received by the Brandeis attendees. A new symphony to reflect the day of Kristallnacht was performed November 17th, 2015 by the Bay Atlantic Symphony in New Jersey. Learn more in the Exhibitions sections. There are lots of Holocaust stories; this one is my father's, as told through a multimedia exhibit at the New Jersey Museum of Agriculture, through January, here on Rutgers University's main campus. We saw the exhibit, "Learning Seeds," when it opened at the Virginia Holocaust Museum, in Richmond, two years ago. When I heard it would be at Rutgers, taking my father to see it again seemed a no-brainer. Dad is 91 and a dialysis patient in upstate New York, but he has always liked a road trip. He thought the New Jersey location might attract other alumni of Gross Breesen, the farm school in Germany that from 1936 until the Nazis took it over, in 1941, provided an education-and for some, a means of escape-for about 130 young Jews. The exhibit centers on some 60 photographs from my father's Gross Breesen album, and includes a video of elderly survivors talking about the school. Named for a nearby village in German Silesia, it was an emigration-training school and a haven from the terror enveloping Germany. The surviving Breeseners are now old, but the school changed their lives, and many of them have gathered annually since 1984, when Dad held the first Gross Breesen reunion, in Utica, N.Y. Some of them joked then, and still do, that the first Gross Breesen reunion was in Buchenwald. But I am getting ahead of my father's story. I was also curious about the venue, private, nonprofit agricultural museum in New Jersey? In my experience, the state was a highway between New York and Pennsylvania. A campus I imagined as thousands of square feet of asphalt and concrete seemed an unlikely place for so agrarian a repository. So when the three of us-George, my father; Heller, my sister; and I-arrived early to tour the museum, we were charmed. The collection includes artifacts not only from New Jersey's agricultural heritage but from ours. Walking is no longer my father's strong suit, but he toured the museum, using his cane, telling us stories about farm equipment. He bought a 1939 model 9N tractor for $1,300 in 1946, when he started farming near Utica, "with a plow and a set of chains, which you needed for the snow." Farmers still use those old tractors, he says, and they can cost $3,000. Nowadays people who want to run family farms, and there are more of them than you think, study agricultural science or animal husbandry at colleges like Rutgers. My father studied those subjects, too, although not in a classroom and under dire circumstances. "Learning Seeds" tells how, in the winter of 1935-36, recognizing that a generation of Jewish college-age students was adrift, and that rich countries like the United States would not take them, the National Representative Agency for Jews in Germany (Reichsvertretung der Juden in Deuschland, henceforth the Reichsvertretung), set up schools to train Jewish teenagers to be farmers. It was a strategy to eventually get them visas to countries that wanted people with agricultural skills. Some schools were Zionist; Breesen was not. My father turned 17 on October 1, 1935, just after the Nuremberg laws changed his life: He couldn't go to school or play soccer on the team he had captained. He wanted to be a teacher, but now college was out of the question. My grandfather, who earned an Iron Cross fighting for Germany in World War I, lost his government appointment to haul goods from the railway station to the merchants in Nordenburg, their Baltic town. The family, with four younger children, was forced to move. Dad doesn't talk much about that time. One thing I have heard him say is that after Hitler became chancellor, in 1933, even tiny Nordenburg saw an aggressive brandishing of swastikas. "Somehow," he says, "I have never been a big fan of flag displays, ever since." Through relatives, my father landed a factory job, and a room, in Königsburg (today Kaliningrad, in Russia), the capital of East Prussia. When he had 5 pfennigs, he would buy a "one-day meal," a big bowl of stew, and take the streetcar to the Jewish youth club, where he swam and played soccer. It was through the youth group that he was selected to go to the farm school, six hours away by train through the Polish Corridor. To this day he doesn't know why he was picked. Jews, only about 1 percent of the German population, lived mostly in cities. Breesen, directed by Curt Bondy, a psychologist and educator, was largely for the children of urban doctors and lawyers. My father, whose father owned a team of horses and whose grandparents milked two cows, was an agricultural expert by comparison. And it was not until he started attending the reunions, 50 years later, that Dad learned that other students had paid tuition, while he had not. Talk about college access. Ernst Cramer, one of the instructor-trainees at the school, who at age 96 is still chairman of the Axel Springer Foundation, in Berlin, e-mailed that "it was Bondy's conviction (accepted by the Jewish authorities) that parents who could afford it, should pay, and others should be admitted without paying anything. Money played no role in who was accepted and who was turned down." Here was need-blind admissions that saved lives. City kids or not, the members of the Class of 1938 found the vocational school unlike any educational institution they had ever known. Housed in a former nobleman's castle, Gross Breesen included 567 acres of fields and woodland, with dairy cows, several teams of horses and oxen, chickens, and even pigs. The animals had to be fed with crops grown on the land; all the people had to be fed and their clothes laundered. Students provided the labor, guided by several live-in teachers and farm managers; the latter were not Jewish, a precarious situation overlooked by the Nazis for a time. The plan was to get visas to Brazil, so the Breeseners studied growing coffee, and by experience learned other skills they would need to farm anywhere-milking cows, shoeing horses, carpentry, cutting hay. Bondy, who knew little about farming, also demanded a broader curriculum. He based it on three "pillars" of culture: agrarian, German, and Jewish. The students tilled the soil, dug potatoes, or shoveled manure in the daytime, but in they evening they studied English and Portuguese, read poetry, played in or listened to a string ensemble performing Mozart, and heard lectures by a visiting philosopher, Martin Buber. The charismatic Bondy came from a family of progressive educators who believed that certain students could learn at an advanced pace in an environment that combined nature, rigorous study, and friendship among teachers and students. A "fourth pillar," Bondy's lectures about Lebenskunden, or "guiding principles for life," had themes like "self awareness" and "moral character." They were designed to teach the future settlers the tolerance and generosity they would need to thrive in countries far from home. Judged by what we now call learning outcomes, the school was a big success. The Breeseners became agronomists, physicists, businessmen, farmers, artists, economists, social workers. In the video that is part of "Learning Seeds," they talk about their unusual lessons. Bondy "taught me to live conscientiously, to be sure to think about how everything I do will affect other people," recalls Kenneth Herman, who became a farmer, "My father was a lawyer, and he was against my going to Gross Breesen," says Carola Rosenthal Domar, who became a social worker. "'No child of mine will become a peasant!'" But then the Gestapo raided her home and, holding a pistol to the 14-year-old Carola's head, arrested her father and sent him to Buchenwald. "When he came out of the camp," she remembers, "his first words were, 'I'm so proud that you are a Gross Breesener,' because this group at the camp had helped others and was very much respected." On November 10, 1938, the pogrom that came to be called Kristallnacht destroyed Jewish-owned businesses and rounded up Jews for imprisonment. When it reached Gross Breesen, the Gestapo ransacked the castle, took an ax to the grand piano, and arrested all the males over age 18. My father, by then an intern on a farm in Bavaria, was arrested, too. Fortunately for him, the Nazis transported prisoners from all over Germany to Buchenwald, where he met the Breeseners. Bondy's ties to the Reichsvertretung meant that people began working frantically to get them visas, because at that time the Nazis freed those who could prove they would leave in 30 days. For my father, meeting the other student-farmers served a practical purpose: "I was arrested on the street, with nothing," he says. "The Breeseners brought blankets. It was November in Germany, and it was cold." My father's only other story about Buchenwald, of Jewish prisoners climbing over one another to see a fellow prisoner hanged for trying to escape, paints neither Nazi nor Jew in the best light. "Good and bad people are everywhere," Dad likes to say. The Brazil plan had collapsed, but a former Breesener who was in the Netherlands got visas for the student-farmers to join him. They were released in January; my father and four others went to a refugee camp in the Netherlands. After a year, Dad and about 15 more Breeseners became eligible for entry under the U.S. quota for German immigrants: A wealthy benefactor had purchased a farm in southern Virginia and, envisioning an agrarian refugee settlement, gave each of them a share. It was 1940, they were landowners, and America would let them in. In a year, the settlement would fold. Some of the refugees, my father included, would speed their American citizenship by enlisting in the U.S. Army, returning to Germany as American soldiers. My grandparents and three of their children would escape to Chile, but without my uncle Herbert, who disappeared, or my father's maternal grandparents, who would die in Theresienstadt. Although a majority of the original Breeseners got out of Germany, the Nazis would turn Gross Breesen into a labor camp; most of the Class of 1943 would be sent to Auschwitz. That Gross Breesen's story came to be told through "Learning Seeds" is the legacy of several farm-school students with a good eye and a good German camera, and the artistic sensibility of Steve Strauss, a photographer in New York City. In 2000, Strauss heard about the Gross Breesen reunions. He attended one and saw my father's 5-by-8-inch album of photographs of the castle-farm, dated 1936, its tiny images not much bigger than contact prints. Oddly, it was not the photos of the boys on their wide-tire bicycles, or the women scything grain and loading hay, or the historic Junker's castle that spoke to Strauss. It was one photograph, which shows sunlight streaming through the window of a barn onto a pile of grain. "Somehow that image was so uplifting," says the photographer, whose Jewish family has deep urban roots. "It was a story that went beyond survival." Grant applications and proposals were written and submitted to Jewish agencies, and turned down. He was about to give up when Ray Miller, my uncle on my mother's side, read the proposal and gave Strauss $25,000. With contributions from other Breeseners, he hired a videographer and went to work. The way it turned out, my father didn't really see much of the exhibit at Rutgers, although he was glad he went to the opening. After Strauss introduced him and Hans-Georg Hirsch, the only other Breesener who attended, and showed the video, Dad was besieged by museumgoers. (It probably didn't hurt that whenever this young, handsome fellow with a head of thick brown hair came on the screen, my largely bald father said, "That's me.") He has always been a sociable guy, so he talked with people, including three children of Breeseners, one grandchild, and even a fourth-generation Breesener, age 4. He did see that Strauss and his wife, Jane C. Felber-Strauss, had painstakingly mounted testimonies from many of the Breeseners from the circular letters, or updates, that they shared after the war, from Brazil, Australia, Europe, and America. Those Rundbriefen, spurred by Bondy but carried on after he died, in 1972, tell the remarkable stories of their lives. Later, I asked my father what all those people who had gathered around him wanted to know. "Things like, 'What was it like in Buchenwald?,'" he said. "'Why didn't the Nazis kill you instead of letting you go free?'" Indeed, I had stepped out of the room once and heard a man talking on a cellphone: "You don't understand," he was saying. "I was talking to him … an actual Holocaust survivor!" Dad answered them, of course: "I wasn't beaten but I heard people being beaten. I wasn't shot, but I heard people being shot." But "Holocaust survivor" was not the person he became, and I find it odd to think of him that way. Most of the people in our farming community, near Utica, don't think of him that way, either. They know him as a dairy farmer whose herd averaged 20,000 pounds of milk annually. Unless you ask him, he doesn't tell you where he came from, and if you do, he will say he was a German Jewish refugee. As he got older, though, telling his story became more important. Once, when I had kids of my own, we ran into some friends at a restaurant with their 18-year-old son, a few nights before the young man was to leave for Stanford University. Dad was visiting, and the conversation turned to what Josh would take with him and what he would study. As we were preparing to leave, Dad said, matter-of-factly, "Well, Josh is getting ready to go to college. When I was that age, I went to Buchenwald." That is the point of the exhibit at Rutgers, at least for me. It wasn't college, but compared with the other experiences of this group of long-ago 18-year-olds, Gross Breesen was an education, and its lessons are ones that any group without hope or promise can aspire to, even today. "Gross Breesen," my father says, was about "being taught that you are worth something and you can accomplish something, and that you were not the despised and degenerate youth" that Hitler said you were. "We were people without a country all of a sudden. … We were Germans and had a German education, and a German upbringing, and all of a sudden we were told, You are not Germans but a degenerate people, and you are the cause of all the evils that exist anywhere in the world. "And Bondy told us, you have a value, and you can accomplish something, and you can become farmers or you can become carpenters. You can do something, he gave us back our self-esteem. … That was our education. Being able to learn things that were worthwhile doing. If that's higher education or not, I don't know. I guess it is." Amidst the somber, heavy and even tragic exhibits and images at the Virginia Holocaust Museum, the story of Gross Breesen provides a dash of hope and relief from unrelenting despair. “This is a positive story coming out of a dark period of history,” asserts Steve Strauss of Fremont, whose eight year effort to create a lasting audio-visual record of the Nazi-era Jewish farm (read more) culminated in the exhibit, which runs through October 10. After growing up on Long Island, Strauss fashioned a commercial photography career in New York City. For many years he was the staff photographer on “60 Minutes,” creating the thematic photographic images behind the anchors as they introduced their segments. Wearing of city life, Strauss and wife Jane finally made the move to Sullivan County full time eight years ago. In 1986, they had bought a “property with views” in Fremont just over the Delaware township line. At the 40th reunion of his Lawrence HS class, Strauss learned about Gross Breesen from fellow grad Sharon Seiden, who had written about one of the farm alumni, George Landecker. In 2000 he attended his first reunion of the “Gross Breeseners,” held at the old Raleigh Hotel in South Fallsburg. It was there that he met Landecker, a dairy farmer from the upstate village of Barneveld, who was to inspire his quest. Landecker brought out a 4x6 photo album and Strauss’s photographic eye was struck by images of a long gone past, especially a photo of a ray of sunlight hitting a mound of wheat in a barn. He got additional encouragement from the late Esterita ‘Cissy’ Blumberg, a chronicler of the county’s “Golden Age” resort era, who was at the reunion. When she heard the story of Gross Breesen, she declared that it ought to be part of every high school library. Over much of the succeeding decade, Strauss pored over letters, communicated with the shrinking number of alumni (now less than 20 survivors, he reckons) and collected photographs – which he had blown up into gallery-sized prints. The project director then found a venue, at the Virginia Holocaust Museum. He is in contact with other potential exhibit sites. One of the things that most impressed Strauss as he learned more about the subject was how the farm shaped its alumni’s future. Strauss hopes to have the multimedia exhibit, which he calls a work in progress, travel around the country and even overseas. This week, a DVD which captures the elements of the exhibition will be shown at the LaGuardia High School of Music & Art and Performing Arts in Manhattan. Strauss’ aims for his project are both modest and ambitious. “If one person can change their view that the Holocaust never happened, then I have accomplished something,” Strauss said. From the time that Adolf Hitler assumed power in in Germany in 1933, Jews became increasingly oppressed and sought to emigrate. German Jewish leaders determined that learning farming and other vocations would be the best avenue for Jewish youth to emigrate, as quotas were tight in many counties. Thus the creation of Gross Breesen, a 567-acre farm on the German-Polish border which operated for several years. Under the direction of Dr. Curt Bondy, an acclaimed educator and psychologist, Gross Breeseners spent long days in the field learning farming, carpentry and other valuable skills. Complementing this agricultural training was a rich philosophical curriculum, imparting lessons in Jewish culture as well as German heritage. More than 150 students from Gross Breesen emigrated to various parts of the world. The survivors, all in their 80s and 90s, maintain a sense of pride at being Gross Breeseners. Dr. Bondy and his teachings get high praise for having provided them with the practical knowledge and spiritual strength to survive and strive. The opening of ‘Gross Breesen the exhibit,’ under Steve Strauss’ direction last month at the Virginia Holocaust Museum, might well be the last time that the farm alumni will get together. Three managed to make it. In fleeing the Nazis, George Landecker veered through the tobacco belt of Southside Virginia. But his flight to freedom began at a farm near the Germany-Poland border. Landecker, approaching his 90th birthday, was among 130 people who in the late 1930s spent part of their teenage years at Gross Breesen, a Jewish-run agricultural-training center. At Gross Breesen -- the subject of a Virginia Holocaust Museum exhibit that opened yesterday and will run for two months -- Landecker and the others learned the skills that might make it easier to escape the doom enshrouding Europe and resettle, in safety, in the United States and other countries. "The group is getting smaller," said Landecker, who inspired the exhibit by Steve Strauss, a New York photographer-videographer. "We are all in our 80s and 90s." Now a retired dairyman from Barneveld, N.Y., north of Utica, Landecker was among three Gross Breesen alumni at yesterday's opening in Richmond. Landecker, his thick hands resting on the hilt of his black cane, recalled in the guttural accent of his native East Prussia his often-perilous journey. After Gross Breesen, Landecker was briefly held at the Buchenwald concentration camp. From there, Landecker went to Holland and, next, Hyde Park Farm in Nottoway County, owned by retailer William B. Thalhimer and his cousin Morton G. Thalhimer Sr., a real estate investor. The Thalhimers envisioned Hyde Park Farm as a refuge for imperiled European Jews. To make it easier for the immigrants to qualify for U.S. residence, the Thalhimers gave them shares in the 1,000-acre farm, where they grew tobacco and raised poultry and dairy cows. But it was at Gross Breesen that the Jews mastered the tasks that would shape their fate. Strauss learned of Gross Breesen from a high school classmate in Lawrence, N.Y., the Long Island town in which he grew up. Many of the Gross Breesen teens went on, Strauss said, to "become overachievers because of the work ethic" instilled by Gross Breesen's director, psychologist Curt Bondy. Bondy, who had worked with prisoners, survived World War II as a professor at Richmond Professional Institute, antecedent to Virginia Commonwealth University. Bondy, who returned to Germany after the war, was a demanding, charismatic man. Or as Anne Strauss, a former Gross Breesen resident who is not related to the documentarian, says on the exhibit video: "a personality you could like and hate at the same time." Those who emerged from Gross Breesen included artists, authors, foundation executives -- and, in Landecker's case, the head of a 200-acre dairy farm. They learned agriculture, Jewish and German culture, and, according to the exhibit video, the importance of "knowing life, knowing people." Hallo, Steve, hello to all of your organizers of this Exhibition, Congratulations for your extraordinary , maintaining the memory of what Groß Breesen meant to many young people trying to start a new life and to survive holocaust. Some 70 years after the end of Second World War and the crush down of Nazi Germany, again we observe in this country and in several others in Europe, tendencies to discriminate minorities e.g. Jews, Sintis, Roma, Refugees from Africa, etc... This must be stopped by good arguments but also by action. So, this exhibition can be also seen as an important contribution to the permanent fight against forgetting what happened and against ideological fanatism, anti-Semitism and fundamentalism. A new exhibit at the Virginia Holocaust Museum. There aren't many Holocaust stories that feature the state of Virginia, let alone our hometown. But the story of Gross Breesen is one such story. In 1930s Germany, Dr. Curt Bondy, a protégé of the Jewish educator and philosopher Martin Buber, felt the winds of change blowing in Germany. As an antidote to increasing Nazi oppression, he established a training farm on the German-Poland border for Jewish youth to teach them agricultural skills that could be of use when they emigrated. In addition to farm work, the students studied Jewish history and culture, and Bondy inculcated in them a sense of social responsibility and a need to give back to the community. In short, Bondy was a mentor and father figure to many of the youth at Gross Breesen. This kind of social experiment was, of course, not tolerated for long by the Nazis. They eventually took over the farm. On the infamous night that became known as Kristallnacht, Gross Breesen became a jail, and the Jewish youth became prisoners in their former refuge. Those 18-years-old and up were sent to Buchenwald; those younger than 18 were imprisoned in barns on the property. Meanwhile, in 1938, Richmond businessman William B. Thalhimer and his cousin, Morton, purchased the Hyde Farmland in Burkeville, Virginia, as a haven for Jewish émigrés. There were several difficulties with this plan, not the least of which were the immigration quotas on Eastern Europeans, and Jews in particular. These quotas were relaxed toward the end of the 1930s, but there were never enough spaces for all who wanted to flee Germany. To get around this, the Thalhimers devised a novel solution. They gave shares of ownership of the Hyde Farmland to émigrés to ease the strictures of the immigration process. Thirty six Gross Breeseners eventually made it to Burkeville. The great experiment ended in 1941 when the U.S. entered World War II. The farm was disbanded and the occupants scattered far and wide. Many ended up volunteering for military service, which, if they survived, would guarantee them U.S. citizenship. Steve Strauss, a professional photographer in New York for 30 years who has also done work for the "60 Minutes" news program, curated the exhibit. He spent the last seven years preparing the show, talking to Gross Breesen survivors, and collecting photographs and stories. It all started when he went to his 40th high school reunion. One of his former classmates mentioned a story she had written about one of the Gross Breeseners. But, she told him, there was a lot more of the story to be told. She convinced Strauss to meet George Landecker, a survivor of Buchenwald and a Gross Breesener. He had published a book of photographs of the farm, based on nearly microscopic 1-inch by 2-inch originals. These tiny photographs are the same ones, albeit much larger, that you will see at the Virginia Holocaust Museum exhibit called "Learning Seeds." Strauss, through his connections in the photography world, transferred the images to digital archives, and had them blown up without any loss of quality. Over the years, the Gross Breeseners have kept in touch, corresponding and having reunions about every year. Strauss mentions that there are over 60 years worth of unpublished correspondence between Gross Breeseners, who live in many different parts of the world. So this saga continues even today, though each year there are fewer survivors to tell it. The full story of Gross Breesen with photographs is on display at the Virginia Holocaust Museum until October 15. Thank you for sending the Gross Breesen DVD. I showed it to my students in the Holocaust Elective class and we discussed what it must have been like to be a Jewish German teenager prior in the 1930s. I was personally moved by how Gross Breesen provided a sanctuary for the teenagers. The footage was beautiful and the short documentary is well done. I also spoke with my supervisor about mounting a small exhibit somewhere, but we haven't been able to reach a conclusion. I am going to speak with one more individual, the librarian, as our new library space has been renovated and perhaps we can do something in the library. I'm also wondering if you know any individuals from Gross Breesen who would be willing to visit Bronx Science and speak about their experiences.